Belle Époque literally means "Beautiful Age" and is a name given in France to the period from roughly the end of the Franco-Prussian War (1871) to the start of World War I (1914). This is picked out because the standards of living and security for the upper and middle classes increased, leading to it retrospectively being labeled as a golden age by them compared to the humiliations that came before, and the devastation of the end which completely changes Europe's mindset. The lower classes did not benefit in the same way, or to anywhere near the same extent. The Age equates loosely to the “Gilded Age” of the US and can be used in reference to other western and central European countries for the same period and reasons (e.g. Germany). Defeat in the Franco-Prussian War of 1870-71 brought down the French Second Empire of Napoleon III, leading to the declaration of the Third Republic. Under this regime, a succession of weak and short-lived governments held power; the result was not chaos as you might expect, but instead a period of widespread stability thanks to the regime’s nature: it “divides us the least,” a phrase attributed to contemporary President Thiers in recognition of the inability of any political group to take outright power. It was certainly different to the decades before the Franco-Prussian War when France had gone through a revolution, a bloody terror, an all-conquering empire, a return to royalty, a revolution and different royalty, a further revolution, and then another empire. There was also peace in western and central Europe, as the new German Empire to the east of France maneuvered to balance the great powers of Europe and prevent any more wars. There was still expansion, as France grew its empire in Africa greatly, but this was seen as a successful triumph. Such stability provided the basis for growth and innovation in the arts, science, and material culture. The industrial output of France tripled during the Belle Époque, thanks to the continued effects and development of the industrial revolution. The iron, chemical, and electricity industries grew, providing raw materials which were used, in part, by the brand new car and aviation industries. Communications across the nation were increased by the use of the telegraph and telephone, while railways expanded hugely. Agriculture was aided by new machines and artificial fertilizers. This development underpinned a revolution in material culture, as the age of the mass consumer dawned upon the French public, thanks to the ability to mass produce goods and the rise in wages (50% for some urban workers), which allowed people to pay for them. Life was seen to be changing very, very fast, and the upper and middle classes were able to afford and benefit from these changes. The quality and quantity of food improved, with consumption of old favorites bread and wine up 50% by 1914, but beer grew 100% and spirits tripled, while sugar and coffee consumption quadrupled. Personal mobility was increased by bicycle, the numbers of which rose from 375,000 in 1898 to 3.5 million by 1914. Fashion became an issue for people beneath the upper class, and previous luxuries like running water, gas, electricity, and proper sanitary plumbing all gravitated downwards to the middle class, sometimes even to the peasantry and lower class. Transport improvements meant that people could now travel further for holidays, and sport became an increasing pre-occupation, both for playing and watching. The life expectancy of children rose. 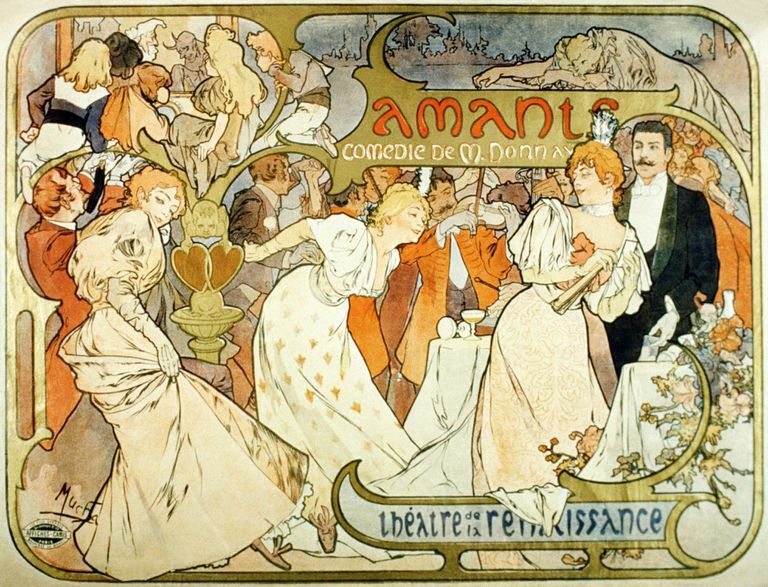 Mass entertainment was transformed by venues like the Moulin Rouge, home of the Can-Can, by new styles of performance in the theater, by shorter forms of music, and by the realism of modern writers. Print, long a powerful force, grew in even greater importance as technology brought prices down still further and education initiatives opened up literacy to ever wider numbers. You can imagine why those with money, and those looking back, saw it as such a glorious moment. However, it was far from all good. Despite the massive growth in private possessions and consumption, there were dark currents throughout the era, which remained a deeply divisive time. Almost everything was opposed by reactionary groups who began to portray the age as decadent, even degenerate, and racial tensions rose as a new form of modern anti-Semitism evolved and spread in France, blaming Jews for the perceived evils of the age. While some of the lower classes did benefit from a trickle-down of previously high-status items and lifestyle, many of the urban populace found themselves in cramped homes, relatively poorly paid, with terrible working conditions and in poor health. The idea of the Belle Époque grew partly because workers in this age were kept quieter than they were in later ones when socialist groups coalesced into a major force and frightened the higher classes. As the age passed, politics became more fractious, with the extremes of the left and right gaining support. The peace was largely a myth as well. Anger at the loss of Alsace-Lorraine in the Franco-Prussian War combined with a growing and xenophobic fear of the new Germany developed into a belief, even a desire, for a new war to settle the score. This war arrived in 1914 and lasted until 1918, killing millions and bringing the age to a crashing halt.